Hairballs in Heaven? | Life. Seriously? Funny! My wife and I do not have children: we have cats. Actually, Frances and I are the permanent staff for our cats. As far as jobs go, this one is enjoyable. That is, if you think cleaning up the remains of something unrecognizable on the floor – left by “The Phantom Puker” – as something considered “enjoyable.” Overall, the cats sit on our lap, desire to be held when they choose, eat food we buy and prepare, and if we are particularly deserving, they will gladly allow us to collect metric tons of shed hair on our clothing, bedding and furniture. Owning a cat is not for the faint at heart. You have to be a very self-confident and self-assured person to love a cat. Your cat will judge your worthiness like an art collector judges a fine painting. It is only after much study, observation and internal debate that an art collector will be motivated to buy a painting or sculpture. A cat will do the same. He will look deeply into your soul. He will drink deeply from his water dish – or your cup. He will then inspect the litter boxes and determine if his toys still have any amusement left in them. Then if the positive values outweigh your personal idiosyncrasies, you will be counted as worthy to be shed upon. It is difficult to imagine how deeply someone can love an animal with a brain the size of a meatball but with a personality encompassing the whole house. December 2011 was a difficult month. 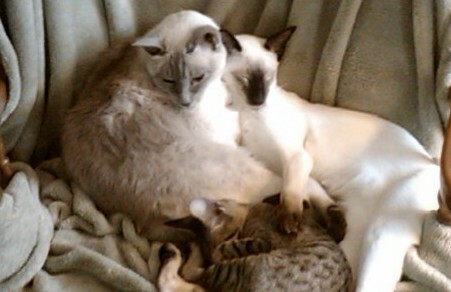 We had to put our oldest female Siamese, Lily, to sleep. Lily would have been sixteen years old in August of 2012 which is a considerable age for a cat. The hardest part of saying goodbye to a pet is the Bible makes no clear reference to where our pets go when they die. There are many lessons God has taught me as I have watched my pets die over the years. I have thought about how God has prepared a place for those who know His Son as their Lord and Savior – and by “know,” I mean a real, living, personal experience which changes your life. If you really “know” something or someone, it will change how you live. Trust me; Lily changed how we lived our lives. In the last book of the Bible, Jesus returns to this earth on a white horse to set up His kingdom. From this, I know there are horses in God’s kingdom. God in His wisdom also allowed John to use the symbolism of animals throughout his descriptions of Christ’s kingdom. God chose to use animals as part of the sacrificial system—the innocent dying for the guilty. Paul in his letter to the Roman Christians tells us all of creation has been subjected to tribulation and difficulty because of human rebellion and sin. I believe if the animal kingdom has played such a vital part in God’s creative order, it is reasonable to believe it will also occupy a place in God’s eternal kingdom as well! So will I see my cat in Heaven? I certainly hope so. Is this a theological stretch? You bet it is. However, I believe since God chose to maintain fellowship with man through the shed blood of “innocent” animals, this sacrifice on their part is also valued by God. God also chose to save the animal kingdom through the salvation provided by the Ark to Noah and his family. Is this “proof” I will see my cat in Heaven? It just is a comfort to know God loves animals as much and more than we do. Posted on January 3, 2012, in Uncategorized and tagged fine painting, litter boxes, owning a cat, personal idiosyncrasies. Bookmark the permalink. Leave a comment.